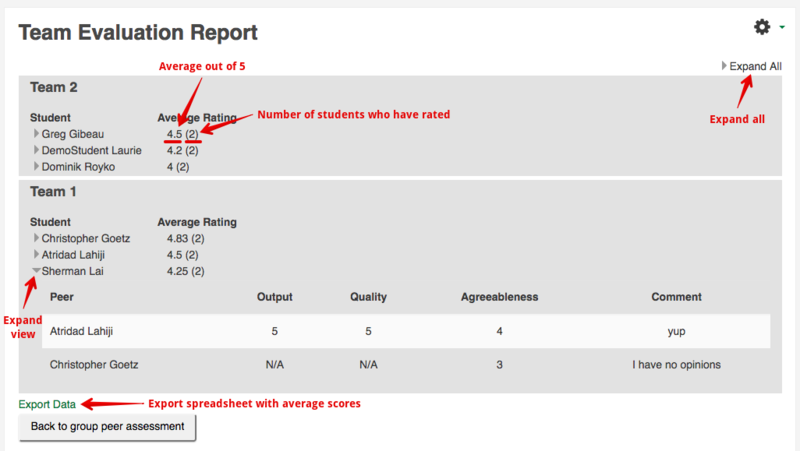 A new activity plugin for Fall 2017 now allows students to provide scores and ratings to all the other members of their assigned groups in eClass. 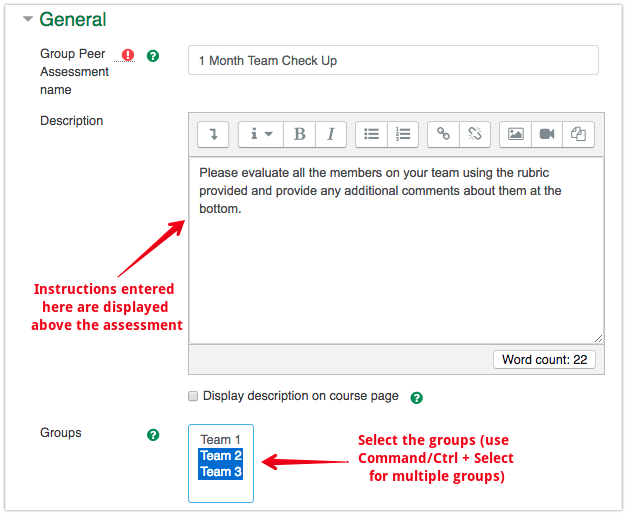 This tool can be used to monitor team progress, peer assess group work output, or deliver feedback on team project participation. Group members are able to score each other on a series of assessment items created by the instructor. Select the Group Peer Assessment activity from the 'Activity Chooser'. The title for your activity is required; the description field is useful for providing context to students and clarifying any instructions they may need to complete their assessments. The groups dropdown displays all of the groups available in your course - you can select as many groups as required using ctrl/cmd click but students will only ever be able to assess the other students within their own group. You will see a warning if a student is included in multiple groups for the same peer assessment activity. 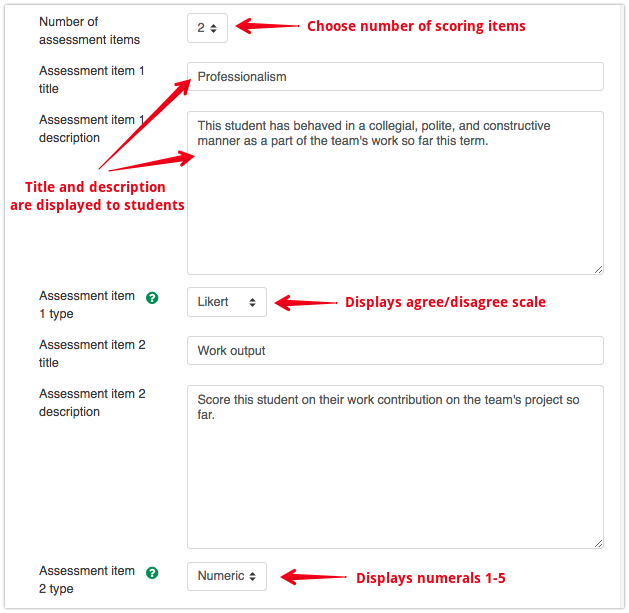 You are able to create up to 9 assessment items for your scoring rubric and a text comments area is always included at the bottom of the assessment items. The title and description are what the student will see when they are assessing their peers. The assessment type offers the choice of Likert: where the students can select from 'Strongly disagree', 'Disagree', 'Neutral', 'Agree', or 'Strongly agree'; and Numeric where the students enter a score from 1 to 5. Display the peer assessment results to students or keep them hidden and visible only to the instructors and TAs in the course. If visible to students, the reviews are always anonymized. Allow students to rate themselves. 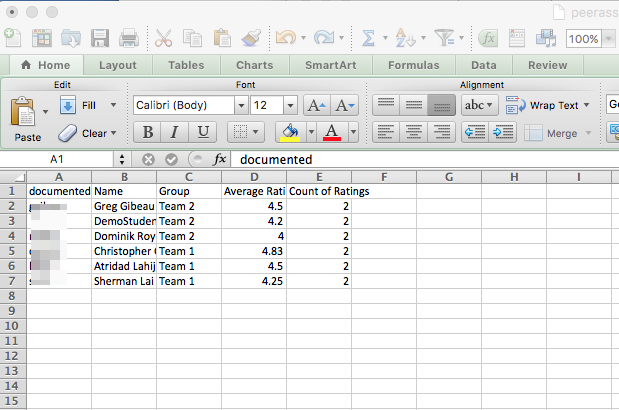 If self-ratings and student-display are both selected, this shows as a comparison between self and peer ratings. Self-ratings are always excluded from any calculated averages. Allow students to opt-out of questions. This will give them the option to select N/A instead of a particular answer to an assessment item. If N/A is selected, that question is excluded from any calculation of averages based on a student's ratings. Set a date after which ratings are cut off and peer assessments can no longer be completed. If this last option is used in combination with student-display, that is also the date/time when students will see the reviews from their peer. Once the options are saved, instructors see a preview of what the assessment looks like to students (without any students to rate). 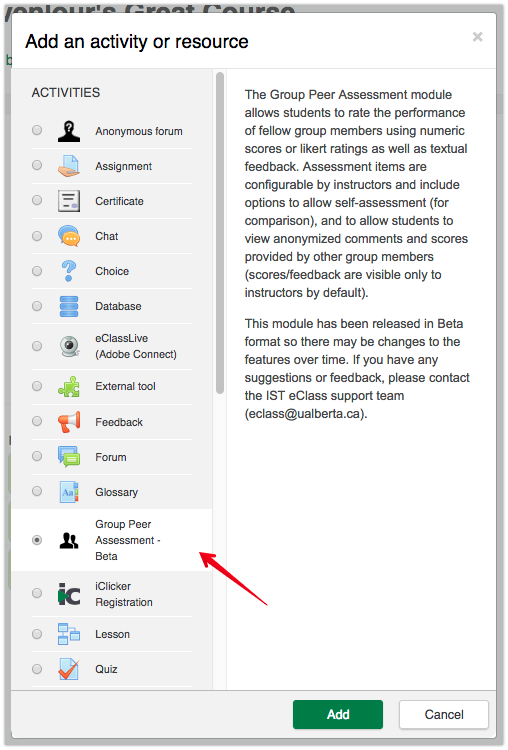 The instructor-view also contains a link near the top right to View the Group Peer Assessment Report. New in October 2018, this report has been reorganized to show all the groups separately with each student's average over all the ratings they have received. Average scores are calculated out of 5, excluding any items set to N/A (likert ratings are converted to a numeric score with Strongly Disagree scoring 1 and Strongly Agree scoring 5). 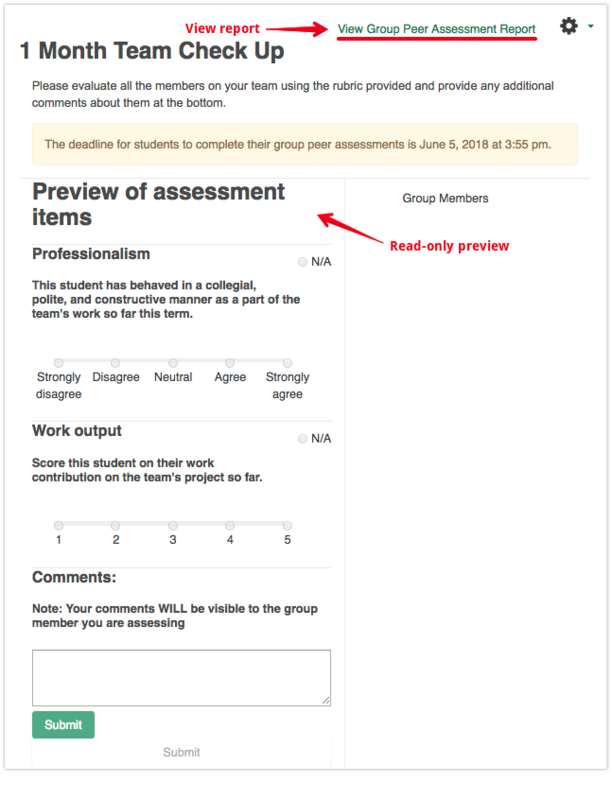 Clicking the Expand icon to the left of a student's name will show the specific assessment item ratings and comments provided by each other group member. Instructors can click Expand all near the top right to overview all the detailed views at a glance. 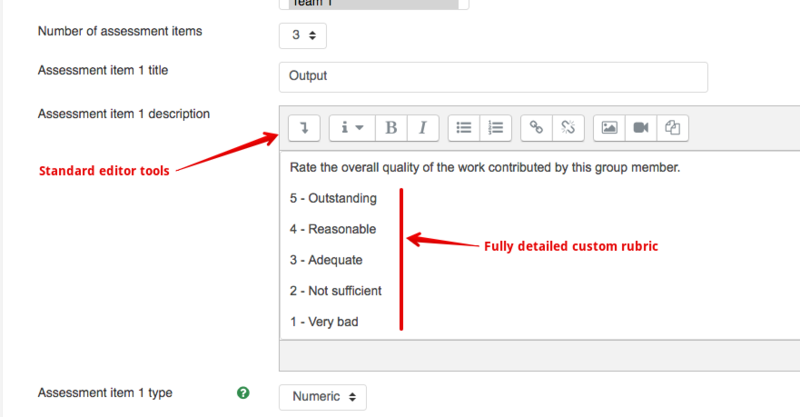 The Group Peer Assessment Report now also offers an export option near the bottom right that can be used to import average scores easily into the eClass gradebook or to perform advanced calculations in Excel. Note that students see a slightly different view - for more details on this, see Rating Other Students Using the Group Peer Assessment Activity.